GGP Chief Executive Officer Sandeep Mathrani, in a 2014 REIT.com video. Updated, 5 p.m.: Comment from Doug Adams. NORWALK, Conn. — Mall developer GGP is considering expanding the retail component of The SoNo Collection, GGP CEO Sandeep Mathrani said Monday. This, as GGP seeks local governmental approvals to reduce the square footage of the project by getting permission to not build the hotel that had been planned. A recording of the conference call is available on GGP’s website. 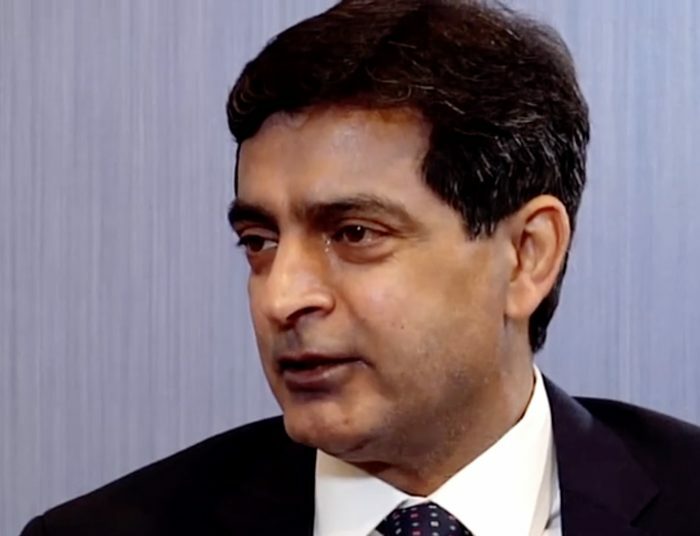 The company is “exploring strategic alternatives” given the low stock prices, Mathrani said, characterizing the stock as undervalued, with a “disconnect” between public and private market pricing. Just over eight minutes into the call, Mathrani states that the company expects to break ground soon in Norwalk. “Demand from retailers has been very strong, and as a result and in discussion with potential institutional partners, we’re increasing the scale of the project. The leasing activity so far has produced rent numbers consistent with our expectations and demonstrated of a regional shopping center with sales productivity well over $700 per square foot. We are about 50 percent pre-leased. He was asked about the return on investment for The SoNo Collection. The call’s last question also got a response concerning Norwalk, as, about 50 minutes in, a caller asked about the value of Class A malls given the current market and negative rhetoric. Multiple references were made during the call to joint ventures with Seritage Growth Properties. NancyOnNorwalk made multiple attempts to contact GGP on Tuesday and Wednesday, calling GGP’s Chicago office and sending emails to GGP Senior Vice President of Investor and Public Relations Kevin Berry and GGP Vice President Doug Adams, with no replies. Although Mathrani said, “The question is, should we increase the size of the project from about 200,000 square feet to 300,000 square feet,” the retail component of The SoNo Collection is 661,552 square feet, according to GGP’s application to change the Land Disposition Agreement (LDA) for the site. He disputed the idea, from NoN, that many people are taken aback by GGP’s request to remove the hotel. “On the contrary, most people with whom I’ve had discussions, want to see this center built. The development is now moving forward and we expect an October 2019 grand opening,” Rilling said. “I wouldn’t be concerned if they move to a JV format. All good companies (regardless of type) project out risk and reward and look at the various options with every facet of the business – ownership structure being one of them. “I can’t speak to GGP’s financials but as they project out risk/reward going to a JV format likely provides their shareholders with the some of the best returns while providing the very good risk mitigation. Seems like the Institutional JV’s have a demand for this product, at this point in time, that may be stronger (i.e. requires lower returns) than other funding sources. On Wednesday, the Real Deal reported that Manthri has made his first move to liquidate an asset, reporting that GGP is looking to sell its half of the New York City retail and office building 685 Fifth Avenue. Common Council members are on Thursday considering GGP’s request to amend the LDA, in a Planning Committee meeting. Lidl, a German supermarket operator, is opening soon in the Staten Island Mall, in space formerly occupied by Sears, Mathrani said Monday. Slate, in an October story, describes Lidl as a “discount” grocery store. Mathrani also mentioned leasing to Kidzania, described on its website as “world’s fastest growing experiential learning center for children,” in two GGP centers, the first locations for Kidzania in the United States. “We look forward to doing more with KidZania,” Mathrani said. CEO Spotlight: Sandeep Mathrani from GGP on Vimeo. “On the contrary, most people with whom I’ve had discussions, want to see this center built. This just goes to show how out of touch Rilling is with the taxpayers. The truth is I have yet to speak with anyone in the real world that wants this disaster built. Considering that this disaster is going to change the face of Norwalk it should be put up for a vote on election day. Come on Harry if you really believe that the taxpayers want this disaster put it up for a vote. GGP previously mentioned that anchors don’t pay rent. Presumably the anchors occupy a large portion of the 660,000 total square footage. Maybe the CEO’s mention of an increase in size from 200,000 sqft to 300,000 sqft relates to the amount of paid retail space. I would like to see parking revenue figures for GGPs other malls. Also is there an impact study on tax revenue when a retail anchor becomes a grocery story or “high-end entertainment concept”? GGP isn’t making any promises regarding tax revenue projections if the mall loses the retail anchors. I’d be interested in knowing what he means by expanding from 200,000 to 300,000 SF. These numbers don’t relate to anything I am aware of. Last time I saw the plans the anchors occupied 300,000 SF out of 670,000. I agree, Bob. Nancy is phenomenal! Based upon what they are projecting for the returns on this property to investors in their recent investor call, we should be bumping them up to A+ or higher on the guarantee to not challenge the tax assessment. Norwalk should be extracting as much value as possible for conceding the last few inches of mixed use on this lot, not conceding more. Currently the agreements are defining class A as being at $425 per sq ft or higher, but GGP expects to reap $700 per sq foot or higher, which is a higher class of mall. And we should hold them to retail, less we get a revolving cast of “flavor of the month” expensive concept businesses that will cannabalize businesses elsewhere in Norwalk. I have been to Lidl stores to n Europe. They are on the same level as Stop and Shop. GGP just confirmed the true value of this property. Investors are lining up for a project like this according to the CEO. Why isn’t Norwalk pushing harder for a larger concession than $3.5MM? FYI, there are not one, but two German grocery chains already making a beachhead here in the US, Lidl and Aldi. I’ve been to both Lidl and Aldi, neither would be considered high end. Plus who is going to the mall to do grocery shopping? Anyone remember the Pathmark Mall? Was that high end? Planning Committee Monday May 15, 2017 at 7:00 pm Room 231. Redevelopment Agency Wednesday May 24, 2017 at 7:pm Room A300. Norwalk is getting a 700,000 square foot shopping mall. The public meetings are unlikely to alter this outcome. But the public should demand that the City receive better and different concessions from GGP in exchange for the loss of the promised hotel and the requested change to the Land Disposition Agreement. While the article is focused on revitalization of dying malls, there is much to learn about the potential for the SoNo Collection to reflect current trends rather than dying ideas. GGP is not offering Norwalk the Mall of Today. They are offering Yesteryear’s Mall. And the 3.5 kickback to the City will not transform an outdated model into something vibrant for the residents of Norwalk. Rather than returning that money to the City, GGP should amend their plan to include pedestrian walkways linking the SoNo Collection to Washington Street via MLK, West Ave, and Wall Street. Some dying malls have later added housing and commerical office space. The loss of the hotel should include the future possibility of mixed use on this site. Otherwise this is a loss for Norwalk.